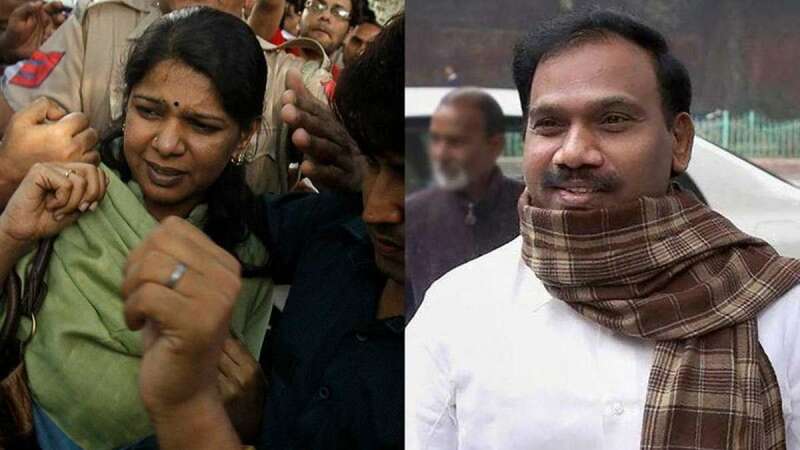 New Delhi : A special court on Thursday acquitted all the accused in the alleged 2G scam, giving a major relief to former Telecom Minister A. Raja and DMK MP Kanimozhi who were jailed on charges of taking kickbacks to issue the telecom spectrum and licences in 2008 at throwaway prices. Special Judge O.P. Saini said the CBI and the Enforcement Directorate had failed to provide sufficient evidence to prove the charges against 33 persons named in the case that contributed to the Congress-led UPA' electoral loss in 2014. Judge Saini pulled up the Central Bureau of Investigation because it had "miserably failed" to prove any charge against any accused in its "well choreographed" chargesheet. "I have absolutely no hesitation in holding that prosecution has miserably failed to prove any charge against any of the accused, made in its all well choreographed chargesheet. All the accused are acquitted," the judge said. The so-called scam came to light after the Comptroller and Auditor General in its report in 2010 claimed that the Telecom Ministry had caused a loss of Rs 1.76 lakh crore to the national exchequer by allocating 2G spectrum and licences to some companies at throwaway prices. The Time magazine ranked it as the world's second-biggest abuse of executive power after the infamous Watergate scandal in the US. The BJP raked the alleged coalition vociferously in Parliament, accusing then Prime Minister Manmohan Singh of choosing to stay silent. Raja was accused of bending and modifying rules for a chosen few and was alleged to have received kickbacks in the form of a Rs 200 crore loan funnelled into DMK's Kalaingar TV. The CAG alleged licences were issued to ineligible applicants who had deliberately suppressed facts, disclosed incomplete information, submitted fictitious documents and used fraudulent means to get access to spectrum. Raja eventually became the face of the scam. Among the others accused of complicity were DMK Rajya Sabha member Kanimozhi and DMK supremo M. Karunanidhi's wife Dayalu Ammal. In his first reaction after the verdict, a beaming Raja said he was "happy with the judgment". The CBI alleged that Raja was biased in allocating 2G mobile air waves and operating licences to telecom firms. It said said Rs 200 crore were transferred from DB Group to Kalaignar TV as kickbacks in lieu of allocation of 2G spectrum to Swan Telecom Pvt Ltd. But Judge Saini trashed the charges because due to lack of evidence. "There is no evidence on the record produced indicating any criminality in the acts allegedly committed by the accused persons relating to fixation cut-off date, manipulation of first come first serve policy, allocation of spectrum to dual technology applicants, ignoring ineligibility of Swan Telecom and Unitech Group companies, non-revision of entry fee and transfer of Rs 200 crore Kalaignar TV as illegal gratification." Former Prime Minister Manmohan Singh, whose image took a battering due to the 2G spectrum allocation scandal, said the verdict had proved that all the "massive propaganda against the UPA was without any foundation". "I don't want to boast. I think the court's judgment has to be respected, and I am glad the court has pronounced unambiguously that all this massive propaganda against the UPA was without any foundation." But Finance Minister Arun Jaitley mocked at the Congress for "treating this judgement as some kind of a badge of honour and a certification that it was an honest policy". He said that in 2007-08, spectrum was not given on the basis of auction but on the price discovery mode made in 2001. "The first-come-first-served policy then got converted to first-come-first-pay." Congress leader Kapil Sibal, who took over the Telecom Ministry after Raja's resignation, called the verdict a "moral and legal victory" for the UPA. "We will ask those who raised allegations against us to apologise," Sibal said, urging Prime Minister Narendra Modi to stop raising the issue now. "Manmohan Singh and the UPA government stand vindicated today." Sibal, who had maintained that there was zero loss to the exchequer, sought an apology from Vinod Rai who as then CAG had in his telecom audit report highlighted the loss Rs 1.76 lakh crore to the state exchequer. He said Rai must also apologise to the nation "as the telecom industry is in dire straits today, thanks to him and the (BJP)".